As posted by the Kitchener/Waterloo/Cambridge Record, December 12, 2013. Volunteers are leading social change right before our eyes. While we worry about Christmas shopping, the newest fashion trends and what our weekend plans are, there are 40,000 residents of Cambridge and North Dumfries thinking about how to help someone through their volunteer work this coming year. Local resident Helen Scutt is a volunteer member of the United Way’s Community Impact Council. She is also a “travelling volunteer” with a Toronto-based charity, Sleeping Children Around the World (SCAW). Her first trip with SCAW was to Kenya in 2010. 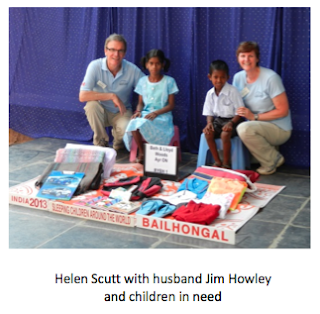 She and her husband, Jim Howley, travelled with a team to India this year to distribute bedkits to 7,000 children identified in the greatest need. The bedkits include a mosquito net to prevent malaria, sleeping mattress, blankets, school supplies and new clothes for the children. The organization works with overseas partners, such as Rotary Clubs, who purchase the bedkit materials locally, identify bedkit recipients, and arrange volunteers for the distribution days. Helen set a personal goal to raise $50,000 for SCAW – that would be 1,429 bedkits, and in three years, she’s almost reached her goal with the support of family and friends. United Way’s Volunteer Centre is here to help you connect to causes that matter to you. Search our online volunteer opportunities database by visiting www.uwcambridge.on.ca and clicking on the Volunteer Centre tab. Or call 519-621-1030 ext. 253. Jennifer Annett works for the United Way of Cambridge and North Dumfries. This column shares stories of volunteers who are inspiring positive change in our community. As posted on The Etobicoke Guardian, December 10, 2013. The Rotary Club of Toronto West is proud to present its 15th annual Rotary Youth Impact Awards dinner and we need your support to make this a rousing success. At this event, we recognize the efforts of individuals who, and organizations which, make a positive impact on youth. 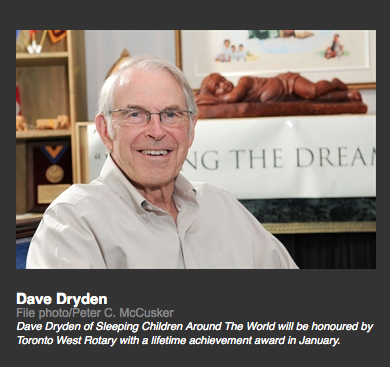 The highlight of the evening is the presentation of a Lifetime Achievement Award, and this year’s recipient is sportsman and humanitarian Dave Dryden. For more than 20 years, Dave has committed himself to Sleeping Children Around the World a remarkable charitable organization which has distributed over 1.2 million bedkits to needy students in many parts of the world. These bedkits contribute to the children’s well being and gives them a better start in their education. Five other awards are also presented during the evening, including two designated specifically to individuals under the age of 25 who have already displayed significant leadership and passion by serving others in their respective communities. This event is a fundraiser for the Rotary Club of Toronto West and over the years we have used the net proceeds raised to fulfill our commitment to help youth achieve their potential in our local community and worldwide. We have, among other things, funded recreation programmes for physically and mentally disabled children at the YMCA, and skill training and counseling programmes for juvenile offenders. As well we have funded literacy programmes in Northern Ontario, distributed free dictionaries in our local elementary schools and purchased paediatric chairs for the Etobicoke General Hospital. We want to continue serving our community in ways that give our most vulnerable children a better opportunity to enjoy their lives and a better opportunity to make a positive contribution to our society. With your attendance at our event, we will be able to fulfill our goals. 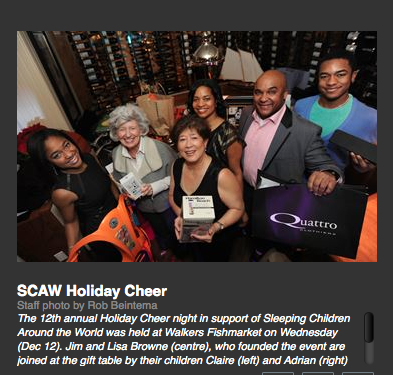 In fact a significant amount of the net proceeds raised from this year’s event will be used to purchase and distribute a large number of bedkits through Sleeping Children Around the World. We look forward to your attendance at our event. For $150 per person you can enjoy a dinner and silent auction and have a lively and entertaining evening at the Old Mill Inn. Please contact me for tickets and if you have any questions, do not hesitate to call.